Elephant Safari is recommended in Kaziranga National Park to spot the Great Indian One Horned Rhinoceros at close sight from the back of a domestic trained Asiatic elephant and lets you enjoy early morning wildlife activities, like birds chirping and the sunrise. You have seen nothing in Kaziranga if you have not done the elephant safari. 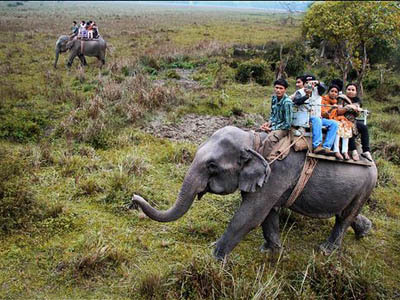 Elephant safari is also the most demanded activity in Kaziranga National Park and its seats are very limited. You have to book the seats earlier as possible you can. The booking process along-with the prices are given below. We have our own elephants in Western Range, Bagori of Kaziranga, therefore you are paying the actual rates described by the Eastern Assam Wildlife Division, Bokakhat, Government of Assam. *Above is including service charge. 1. 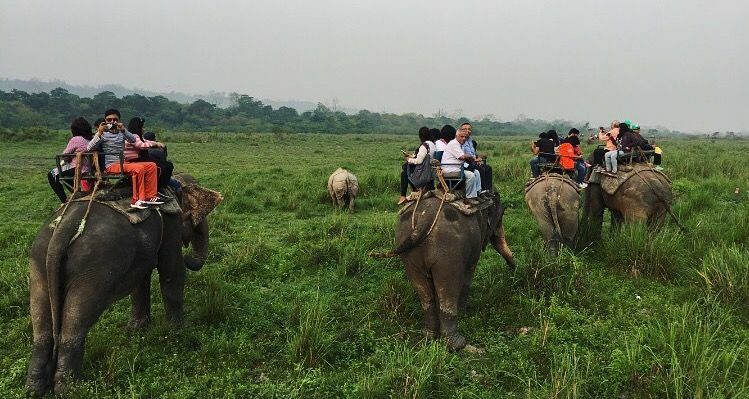 Tour Operator from Kaziranga Adventures is only responsible for booking the seat and collecting the payment from tourist. 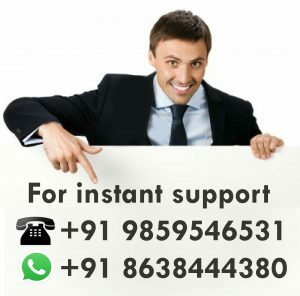 Also he will provide the payment receipt at the time of payment/arrival. 2. Entry pass should be collect by the visitor(s) by himself/themselves from the Government Ticket Counter or from the Tour Operator(s) / Driver at the time of safari. 6. The visitor are requested to carry their identity proof while collecting entry passes. If required. 8. Hotel pickup and drop service will charge extra if the the hotel is out of tourism complex. 9. We are not responsible in any delay or technical problems while collecting the entry pass from the Government Ticket Counter. 10. Safari inside the National Park may close due to census or road construction without any prior notice from the Forest Authority. 11. Elephant safari time and zone will be confirmed one day earlier in the evening after 7 pm only. 12. Elephant safari seats are booked subject to availability.